So, you’ve got SimCity or thinking of buying a SimCity CD Key but you can’t stand the idea of waiting until 8th march for the game to unlock in the EU? Well, SimCity has already been released in the USA. That means that while USA players are building Simcities and having fun, you are waiting around for nothing until the game finally unlocks in the EU on 8th March! What if I told you there was no need to wait this long? You can actually bypass the release date for SimCity with relative ease 🙂 The method is completely legal, takes 5 minutes, and we can confirm that there is no risk of your account being banned, as many people use a VPN for simple privacy reasons. If the game says that it’s not released in your region yet and is unavailable to download, here is what you need to do to unlock the game. Follow THIS TUTORIAL up until the part where you connect to the VPN. Rather than connect to the russian VPN, connect to the American one, so it gives you a USA IP Address. When you shut down the VPN you will notice download speeds return to normal. Can I get banned by using a VPN or bypassing the Release Date Lock? No, you absolutely will not get banned for doing this. When I’ve connected to the VPN, Origin keeps going into Offline mode? To fix this issue, connect to your VPN, ensure you are connected, and CLOSE ORIGIN. 6. Disable “Internet Protocol Version 6 (TCP/IPv6)” by unclicking the check mart box and then hit OK.
7. By doing this my VPN uses IPv4 and it connects just fine to Origin. 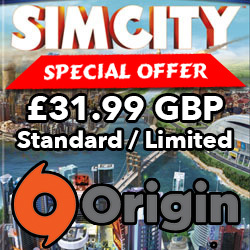 Where can I find the cheapest place to buy an Origin CD Key for SimCity?